We’re excited to announce our first giveaway ! In collaboration with Firelight Camps and Early Morning Farm located in the finger lakes region of New York, this special vacation in the woods of upstate New York involves awesome food, beautiful scenery and a diner cooked in (our!) cast iron cookware. Like every great partnership, our giveaway has a backstory to it and we’re happy to fill you in on how we keep meeting these cool businesses across the country. Depending on how long you’ve been following our story, you might already know that our company is run by a pair of artists; Alisa Toninato and Andrew McManigal. Most people know them under the FeLion Studios brand of custom cast iron art & cookware when Alisa and Andrew originally built the big ol’ artpiece of interlocking skillets that created the map of the United States as cast iron skillets. The artisan underground of iron melting craftsman has an International network that has taken our company’s CEO and COO around the country meeting other awesome artists and connecting with really cool small businesses, which usually leads to some kind of exciting collaboration of sorts down the road. This past summer, Alisa left the ASC headquarters for a full month to travel to Scranton, Pennsylvania, to help teach an iron casting workshop where her furnace and mould making experience helped guide a group of high school age students through an *awesome* program run under the Keystone Iron Works organization. Each year, Keystone Iron Works pulls together an amazing 2 day public event called “Arts on Fire” in downtown Scranton. 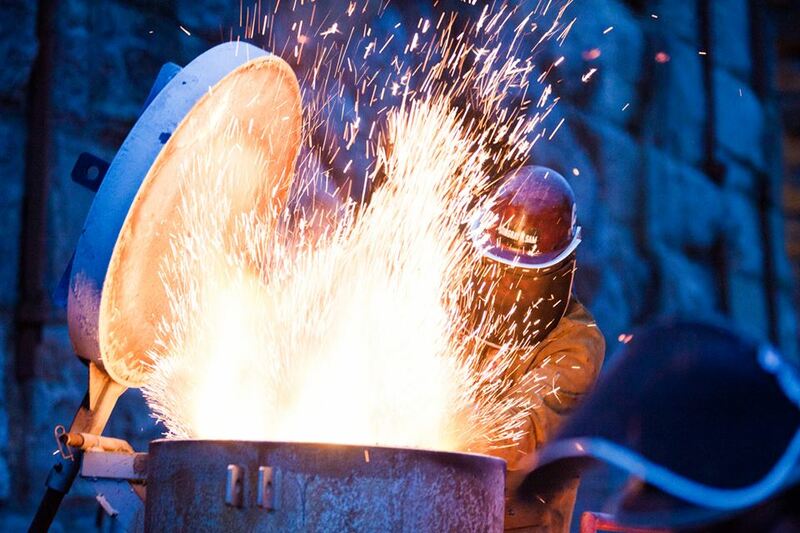 The core of this spectacular event calls upon the city’s youth to get involved by intimately learning the fire arts through making their own custom iron pieces during the 3 week long workshop. Most of these kids have never even worked with clay, much less mould making and pouring molten metal! The program’s secret weapon is an amazing creative director and artist named Nikki Moser, who’s vision for success is motivated by the cross-pollination of bringing in nation-wide iron artists to Scranton, PA, to help take the students from start to finish through the full iron casting process. It’s not only a great way for the students to learn new processes and tricks of the trade from National professionals, but it also gives them the opportunity to meet career bound artists working in an industrial field successfully. The end result allows these kids to walk away with an invaluable set of multiple new skill sets along with a piece of art that they made, while helping to pour other student’s works publicly at the event. One of the program’s staple collaborators every year is an accomplished pattern maker, foundry artist, and professor of sculpture at the University of Cortland New York, Vaughn Randal. If you’ve never heard of him yet, now’s your chance to get enamored by his impeccable craft and ability to make literally anything ~ especially in cast iron. Vaughn Randall performing a Chinese technique for making fireworks called DaShuHua . This past year, Vaughn blew our minds with an incredible performance that involved throwing a ladle’s worth of molten iron at a drywall prop to create tons of sparks! A technique is called DaShuHua, something that he learned during an artisan residency in China. This iron-laden fireworks display was the highlight of the first night’s event, and something that everyone will be asking about for years to come,…we’re pretty sure. After every artisan iron pour, there is a party of some sorts. For Arts on Fire in Scranton, Pennsylvania, this meant inviting everyone up to an outdoor canopy by the railroad tracks to enjoy a gourmet grill-out, brisket, mac’n’cheese, salads and libations. After the iron pours, everyone eats! Tracy and Chef Mark Seibert played with different food styling in the USA Skillet while the brisket stayed warm. Vaughn Randall’s wife Tracy, (another amazing artisan from the USA,) joined in the merry making and added an extra touch of creativity to the food presentation using one of the New York skillets. Tracy is the rock star developer and photo journalist for new recipes at Early Morning Farm, (whom we’ve paired up with for this Giveaway!). Through Tracy’s friendship, Alisa (American Skillet Co.) was introduced to Emma Frisch, an amazing and down to earth chef and co-founder of FireLight Camps. Emma often goes to the near-by Early Morning Farm around Ithaca, NY, to collaborate with Tracy on fun new video recipes and cooking tips that get posted on their sites. Soon, the connection was sealed within all of our mutual passions for iron, art & great food with good hard working people. Collaborating together on a fun invitation for people to get to know more about what we’re all doing seemed to be a natural fit! So, if you or a friend of yours is in the Northeast and looking for a great reason to take a trip out to the finger lakes region of New York, here’s our best suggestion for you:} Sign up for this giveaway and enjoy the benefits of a kicking back at a beautiful campground with amazing food and the prize of an American Skillet Co. skillet to take back with you after the trip. We all work so hard~ time to take a break and enjoy good company at an amazing new place!